This post comes during a great deal of pondering. I am no Mary, but these words have spoken to me. This story is written with great tenderness and awe for parents who have walked a similar road with a very different outcome. If read by one such as this, I hope that shines through these words. Deep in my heart dwells empathy for the brutal possibility of losing a child, and yet I don’t fully know it. I live life with friends, acquaintances and strangers who have walked this devastating path. I wrote about my wrestling with the mystery of the miracle a few years back – that is a wrestling match that continues within. The events of a week ago have only magnified my questions. Before you continue on, please know that a full recovery is expected for our precious daughter. It was a week of 70 degree North Carolina blue sky days. This weather had beckoned and called out to our older daughter and led her to time spent alone in her new backyard. On one such day, I realized that she had climbed way up into a tree in the corner of our yard. The tug of war between “protective mommy” and “encourage the risk taking mom” flitted through my mind as she excitedly shared her adventure with me. There was a nest way up high – she was so excited. The “adventure loving, put my fears aside mom” won out. The “be careful” mom voice was quelled. In hindsight, a more full integration of the two would have been appropriate. On Friday night, good friends arrived at our home to enjoy our new place, and our four girls excitedly ran around to explore. We were midway through an adult home tour when I heard the voice of our youngest girl. It was frantic and of a different pitch. Her sister had fallen from a tree. Come now! I ran to the tree and what I saw almost stopped my heart. My tiny 60 pound girl lay flat on the ground. I know that some of my auto pilot response was shock, but I also in that moment knew deep in my soul that my undivided and true presence was critical. Everything else must fall away. I have practiced and practiced symbolically holding my children in the palm of my hands and letting them go to God. As I knelt down beside my precious, barely conscious girl, my heart and hands let go. It was terrorizing, but the raw truth was this was a situation over which I had absolutely no control. In that moment I knew in a way I’ve never known before that I must remain present for my girl and that there were no guarantees whatsoever about how this particular story would end. It was a severe surrender. Very soon the EMS team arrived and they asked lots and lots of questions of my girl and of me. She was extremely confused but she was talking and conscious on some level. Altered state is how they described it. How far up was she? I literally could not make myself look up to the height of the nest that she excitedly told me about just a day or two before. In hindsight and with information from the three 9-11 year old witnesses to the fall, we now know that she was about 15 feet high when the branch snapped. The nest she shared with me was located at least double that height in the same tree. The EMS team kept saying she fell 15-20 feet – I now believe that they knew that a 30-40 foot drop would play out in a much different way. The EMS team was amazing. As we loaded up into the ambulance, the driver spoke incredibly gentle and merciful words to me – “Mom, we don’t see anything too critical at this point, but we are going to use lights and sirens to get there asap”. PLEASE DO! Was my reply. You don’t have to explain anything. I wanted her in capable hands as fast as possible. The pediatric trauma team was professional and gentle at the same time. A social worker needed to get basic information from me, but when I expressed that I needed to be right next to my confused and terrified girl while she was being peppered with question after question, she pushed me through to this position. I spoke words of comfort in a calm voice. These words came almost automatically after lots and lots and lots of practice doing the same for both of our girls in their early days, months and years with us. Even though my girl was confused and didn’t know who I was, she did respond to my voice. I heard an observant team member say “mom is calming”. They let me be right by her side for the duration. CT scans, xrays, ultrasounds ensued. As she moved through the scans, I sang skidamarink-adink-adink and a special song I made up just for her during her early difficult adjustment days in our home. Each professional showed mercy on mother and child as one test after another revealed no structural or internal damage. They were quick to communicate this to us. We were told over and over again how lucky/fortunate/blessed was she. Both my young daughter and I have come face to face with raw vulnerability, mortality and the fact that life can change in an instant. After several hours and many negative tests, dad and sister arrived. Our precious daughter/sister was beginning to fully return to us. I prepared her that when her daddy walked in the door, I would most likely let down and cry. She was gracious and understanding. The tear flow was a relief. 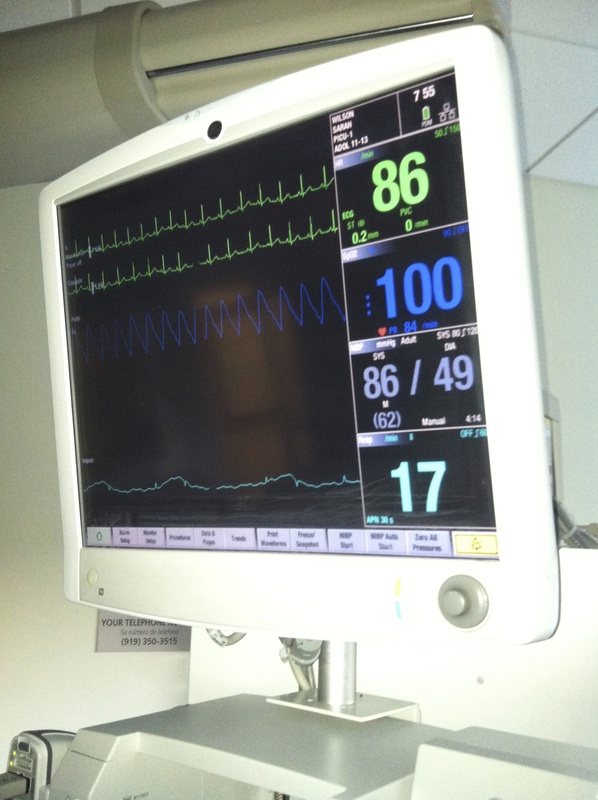 In the quiet of the night in the ICU, I often rose from my resting spot, put my hand on her beautiful face and let those tears wash down my face. Around 4 am, the cervical collar was removed, and we were gifted several hours of rest. The next afternoon, my precious girl got up and walked out of the hospital with her mom right by her side. Concussion was the diagnosis – not a sore muscle in her body. My husband – he is a rock and was a tremendous comfort and shelter for our younger girl who witnessed this terrifying fall. He has supported and been available this week as we all begin to recover and move forward. 4 adults – there were 4 adults on the scene when this happened. We each had a critical role from being present with the three young witnesses, to calmly relaying 911 orders in the early minutes. Mulch – this tree is in a back, neglected corner of our yard. Years of leaf fall and leaves blown into this place created a nature pillow for our girl to land upon. Calm – through meditation and yoga, I have practiced remaining present and calm in the midst of difficult times. This was like a final exam. The many hours of practice and study prepared me for such a time. My daughter has also practiced deep breathing and calming. She was able to access that at critical moments. Parenting paradigm shift – I am grateful for Conscious Discipline and The Connected Child and all the teachings that I have worked hard to embrace and incorporate. The “you are safe”, “I am with you” message was critical to impart during those traumatic hours. Our people – family, friends and teachers who know and love each of our girls and us and have stepped in to bridge gaps, support and encourage each of us through these days. We have needed a slow trickle of support so that we can mostly focus on rest and recovery. That has been respected and provided. Mental health providers – we have had a great deal of relationship and connection with them over the years. We are now set as needs arise. Lice – 48 hours after the fall, it became obvious that lice were on my children’s heads. I am a former OCD, over the edge, lice responder. Lice are now in perspective. After uttering a few cuss words and a big REALLY?, we arranged for the mobile lice lady to come. We are all now clean and well educated and hopeful that we can go into prevention mode from here on out. I felt like a regular mom dealing with regular kid stuff. That was a gift. Emotionally, I am a roller coaster. Anxious to weepy to filled with gratitude. When we birth or adopt children into our hearts and lives, we become extremely vulnerable. I have heard someone say that being a parent is like walking around in life with our heart exposed on our sleeve. Most of us don’t spend much time thinking about that because it is terrorizing. For any of us who truly love, our hearts can be crushed and devastated in an instant. “ I feel the fear of all the “what ifs” that come with such an accident. My prayers are with you as you move through all these and many more emotions surrounding this event. Thanks be to God for the power of grace that touched (our girls’ name) in that fall. For me, I don’t understand grace, but I believe you were touched by it and it continues to surround (our girls’ name).” Within my belief system, I hold onto the thought that even if we had a different outcome on that day, grace would still be a part of our story. But it would have been a much more severe grace. In the midst of our daughter’s four names is the word “Grace”. The Chinese name that she was given can be interpreted “sunshiny blessing from heaven.” In days, months and years ahead, we will all continue to ponder and wrestle with this grace and blessing in our midst. With extreme gratitude and humility, I will move forward. I imagine that there will be much to write of in days ahead. Ever since I opened my newspaper and let this picture sink into my heart and soul, it will not leave me. The article reported that Mercy is now on her own as people treat her as outcast since she loved and lived with someone with the dreaded ebola. This haunts me and makes me feel sick inside. A nine year old girl left all alone and shunned as she grieves the loss of her mother. This could be me. This could be my daughter. As I recently listened to an administrator from the now infamous Dallas hospital that continues to deal with the spread of ebola, I became angry. Understanding that his goal was to reassure and attempt to calm the people of Dallas and the US, nonetheless his words were arrogant and hollow. He said something to the effect, “We are not West Africa. This disease will not spread in our country.” He has already been proven wrong. What makes us as Americans believe that we are immune from participating in the pain and suffering of being human? Has our wealth and power so blinded and soothed so many of us that we truly believe that we can punch a ticket and get a pass on such pain. This virus, and so many other painful things, are no respecter of nationality, income level or person. There exists no inoculation from pain and suffering We are connected and in this together. Believing the delusion that we are not in this game is dangerous and has a high cost. I have no answers. I lift this precious Mercy and all others like her up to God and beg that someone show her true mercy. Thinking about this situation and the what ifs for my own family is excruciating – my mind jumps to a time that I read The Road by Cormac McCarthy. It is unfathomable to think about choices we could be forced to make that involve the hearts and souls of our children. What will I do if this disease knocks on our family’s door? Or that of my neighbor? It already has – Mercy is my neighbor. *If any of my readers know anyone or any organization that is doing good work in the stopping and treating of ebola in West Africa, please share. “Mom, we have GOT to step up our Halloween game” has slipped through our oldest daughter’s lips on several occasions since our recent move. Of our five children, she is the most interested in mystery, ghoul and horror. The rest of us range from disinterest to down right scaredy cats. Personally, I enjoy the costume and candy aspects, but have no desire to feel scared or grossed out. I prefer to avoid anything that might affect my sometimes fragile night time sleep. Silence of the Lambs is a movie that I still greatly regret seeing – and that was well over twenty five years ago. In our former neighborhood, the tradition was to gather in a cul-de-sac, share a hot dog dinner, let the kids parade around in their costumes and then hit a reasonable number of houses for tricks and treats. Because our particular house was situated on a connector street between two neighborhoods, we rarely had our bell rung on that night. It was a big disappointment to me. We always purchased candy and hoped for children to stop by, but it was a rarity. 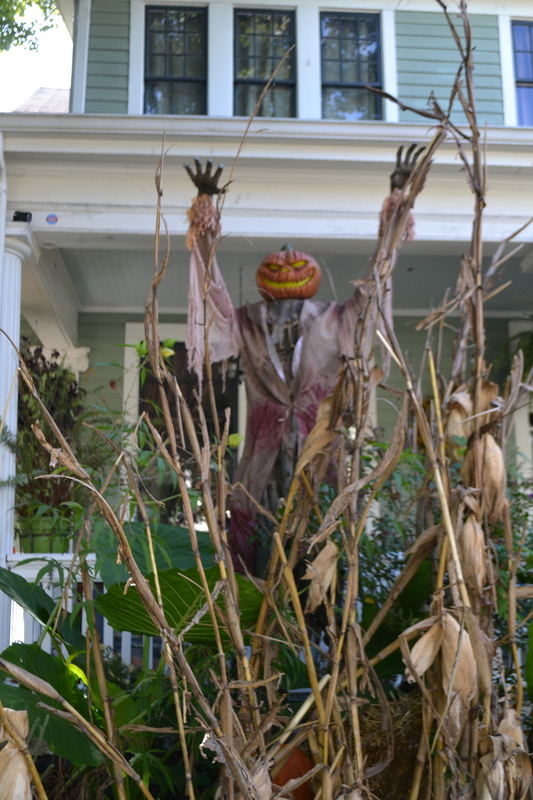 Apparently, we have moved into Halloween central neighborhood. It is a historic neighborhood where the houses are close together and connected by sidewalks. One can get a boat load of candy in a short amount of time. And then there is Jesse. His house is known as “the Halloween house” or the “scary house”. He has literally been setting up for this big night since early September. One of the neighborhood thrills is to walk by every day, or even better night, and see what new and gruesome decoration has appeared. On the weekends, he spends hours arranging and rearranging his props and is always ready to converse and share with all who walk by. I have heard from a reliable source that this fascination with Halloween was born out of a childhood that was denied participation in this holiday. He is making up for lost time. And our home is located one block and around the corner from this ever-growing freak show. 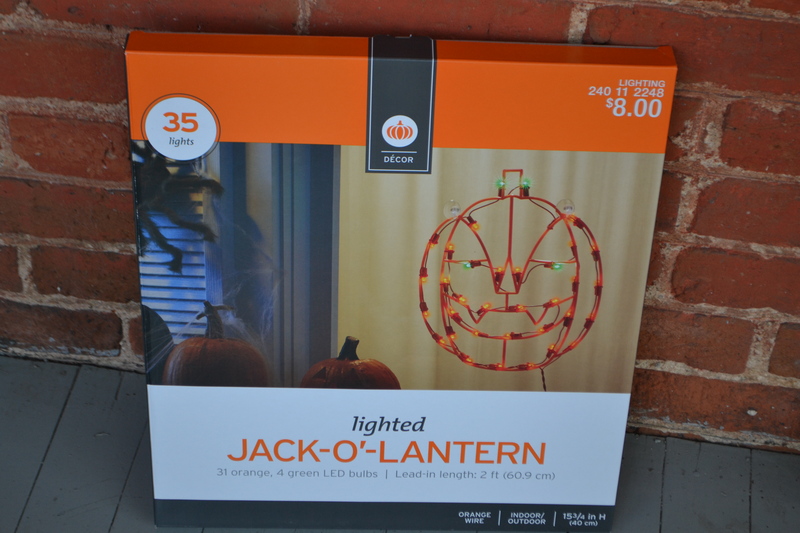 So, our oldest girl is putting on the pressure to go beyond the one lighted jack-o-lantern exterior décor. We have had to negotiate and discuss our various desires and goals for this night. You see, I love little children, and I don’t want to scare them. I want them to happily walk up to my house as I hold out candy for the taking. We are moving away from tombstones, blood and body parts and settling on spiders, one skeleton and my personal favorite, pumpkins and orange lights. It is a negotiation. One thing we are convinced of – we had better be prepared on Friday night October 31st. Jesse has assured us that he gave out over 2,000 bags of candy last year. Given our proximity to what apparently at times is a Halloween mob scene, my husband is shopping and calculating how to get the most and best candy for our buck. 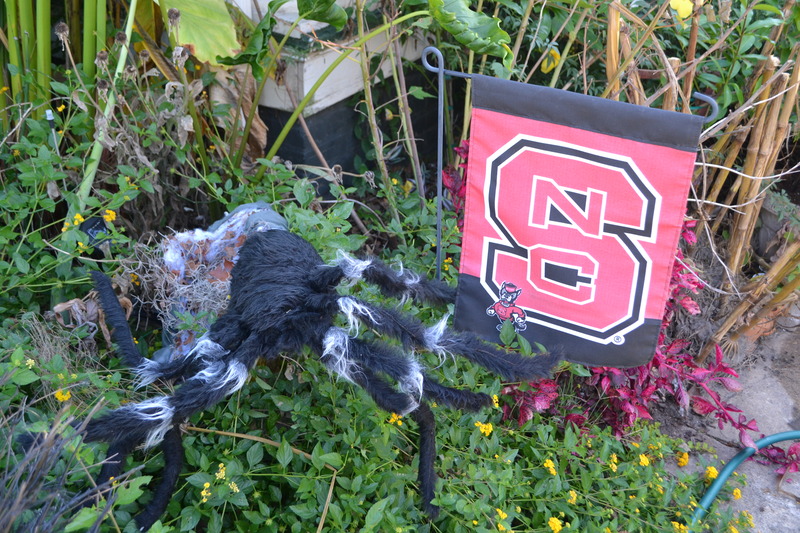 We received this email from the former dwellers of our particular home – “Be prepared for Halloween. We had over 1000 kids last year.” 1,000??? Really. Surely he is exaggerating. So, I will finally get my wish to have lots of trick or treaters. One hundred would be a good number, but I guess we’d better get ready for a thousand. 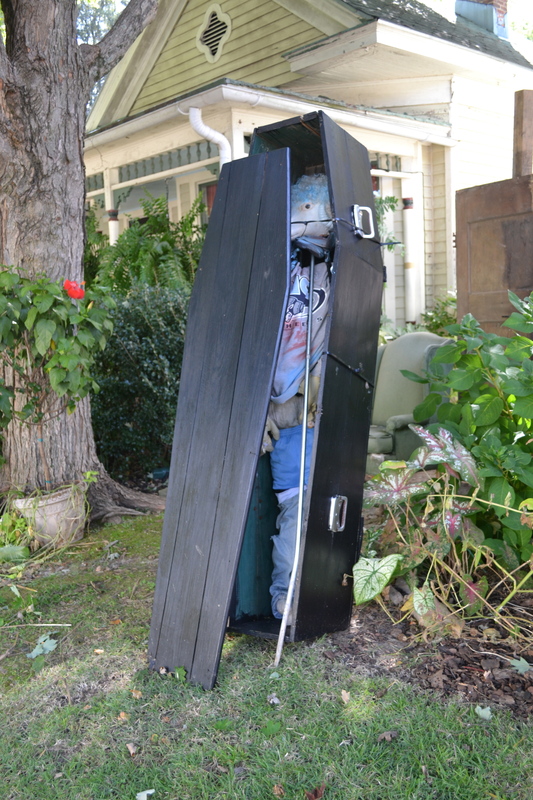 I need a good costume idea to get into the neighborhood spirit. Any ideas? 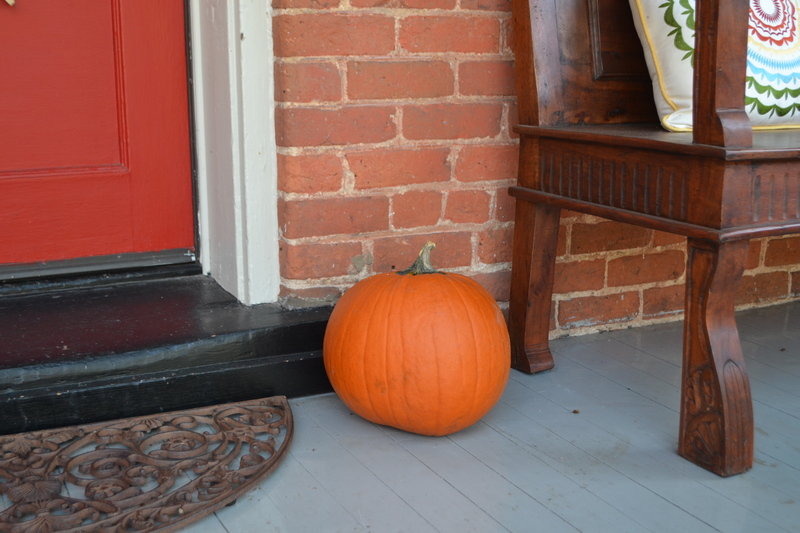 Remember, I love little children and want them to be comfortable walking down my short front walkway…but I also want to put some effort toward stepping up our Halloween.